The Atlas Mountains (Arabic: جبال الأطلس ) are a series of mountain peaks that run along the northwestern portion of the African continent, extending through modern day Morocco, Algeria, and Tunisia. 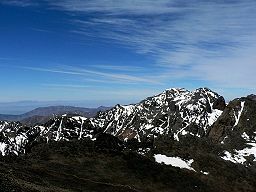 The terrain of the Atlas Mountain range is particularly difficult to cross due to its extremely high peaks, reaching a towering 4,167 meters (13,671 ft) at its high point, Jbel Toubkal, in southwestern Morocco. Other notable peaks are slightly smaller, particularly mountain M'Goun, which measures 4071 meters. The difficult terrain of the Atlas Mountain Range extends 1,500 miles, and for this reason the range served in the past to geographically separate the northern coastline of Africa from the Sahara Desert. While the range has been passable for many centuries, evidence of the historical divide is still present the in cultural and societal differences on opposite sides of the range. The region is rich in iron ore, lead ore, copper, silver, mercury, rock salt, phosphate, marble, anthracite coal, and natural gas, among other resources. For ease of discussion and study, the Atlas Mountain Range is commonly divided into six separate ranges: Middle Atlas, High Atlas, Anti-Atlas, Tell Atlas, Saharan Atlas, and the Aurès Mountains. Over 80 million years ago, the first phase of Atlas Mountain formation began. This stage consisted of a series of continental collisions between African and Eurasian plates. The collisions forced layers of limestone and sandstone up from the earth, effectively forming the first level of the mountain range. In the section of the Atlas Range termed the High Atlas, the continental collisions resulted in extremely high outcroppings of stone. In other areas, such as the Anti-Atlas, only small outcroppings resulted. In the second stage of geological development the earth's crust significantly expanded, resulting in a separation of many previous continental formations. When the continents broke apart, many sedimentary basins were formed, including the Atlas Mountain Range. The last stage of geological development was marked by a massive continental collision between the southern end of the Iberian peninsula and the European plate. However, this continental collision was remarkably different that the first stage of development. When the mountains were first being formed, the collisions between continents pushed excess material upwards, forming a mountain ridge along the line of collision. In the continental collisions that took place in the third stage of development, geologists are divided as to whether this type of collision took place. While the most probable method of geological formations involved continental plates sliding over one another, there is very little evidential support for this hypothesis. On the other hand, there is also little support for a violent, rock-spewing collision. Geologists are often surprised by how little evidence crust thickening or plate shortening is found in the region. Recent studies suggest that deep processes rooted in the Earth's mantle may have contributed to the uplift of the High and Middle Atlas. While the Atlas Range owes its formation to the shifting of the earth, the ramifications of living on a fault line have had a marked impact on the civilizations that call the Atlas their home. The city of Blida, located in the center of the Tell Atlas range, suffered a fatal blow in the nineteenth century from a strong earthquake. The city of 265,000 inhabitants was completely destroyed. A similar instance occurred in 1980, when a 7.3 magnitude Richter Scale quake rocked the small city of Ech Cheliff. The city suffered 5,000 fatalities in the earthquake. Located in the central portion of Morocco, the Middle Atlas Range lies north of the High Atlas and west of the Tell Atlas, stretching for 700 kilometers. Overall, it is distinguished by a high average peak height, with many individual mountains reaching altitudes upward of 8,000 feet. The highest peak for this section of the Atlas Mountain range is Jbel Bou Naceur, which measures 3340 meters. It is a common site for hikers and adventurers seeking to explore the beauty of the Atlas Range. One of the attractions of the Middle Atlas is it pleasant environment, as much of the range is covered by green plant growth and receives a large annual amount of rainfall. In fact, the Middle Atlas hosts a ski resort in the town of Ifrane, an unusual occurrence in Northern Africa that takes advantage of annual snowfall to attract tourists and sports enthusiasts. The basin of Sebou: Discharging to the Atlantic Ocean. The basin of Oum Errabiaa: Discharging to the Atlantic Ocean. The basin of Bouregreg: Discharging to the Atlantic Ocean. The basin of Moulouya: Drains to both the Middle and the High Atlas, as well as to the Mediterranean Sea. The High Atlas range is located in Morocco sandwiched between the Middle Atlas to the north and the Anti-Atlas to the south. As its name suggests, it boasts the highest peaks and highest average elevation of the entire range Atlas Range. Particularly notable is Mount Toubkal (13,665 feet or 4,165 meters), which lies in Toubkal National Park and is the highest peak found in the Atlas range. The landscape of the High Atlas is marked by deep gorges, green valleys, and large rock outcroppings. Like the many of the subdivisions of the Atlas Range it receives a steady annual rainfall that contributes to the well being of surrounding civilization. In the case of the High Atlas, the natural river system has been augmented by a series of hydroelectric dams and artificial lakes. By harnessing the electric power of water runoff, Morocco benefits from the impressive mountain stretch. Culturally, the High Atlas Range divided the more populated northern portion of Morocco from the desert half of the country. While only a rough division, the High Atlas divides the country into two segments, with the northern portion containing approximately two thirds of the country's land. To the south lies the Sahara, and the range serves as a boundary to prevent the hot winds from entering the more temperate portions of Morocco. Near Barrage Cavagnac, there is a hydroelectric dam that has created the artificial lake Lala Takerkoust. The lake serves also as a source for fish for the local fishermen. Panoramic picture of the artificial lake of Lala Takerkoust. The Anti-Atlas range is found in Morocco, where it lies between a large plateau and an extensive plain. This section of the Atlas mountain range is the most extreme western border, reaching all the way to the Moroccan shores of the Atlantic Ocean. In total, the Anti-Atlas range spans for approximately 500 km, and contains many peaks that exceed 6,000 feet in altitude. Geologically, the Anti-Atlas is distinguished by a large concentration of granite boulders that form a breathtaking visual effect. It also boasts silica–rich soil that has become compacted to form access routes through the range. The rock structures in the Anti-Atlas date from the Pre-Cambrian period, a fact which makes them older than the formations found to the northwest in the High Atlas. The Tell Atlas range runs along the northernmost edge of the African continent, bordering the Mediterranean Sea to the north and a series of salt water lakes to the south. It lies to the east of the Middle Atlas and directly north of the Saharan Atlas. The length of the range is over 1,600 kilometers, a distance which spans from Morocco on the west to Tunisia on the east. The bulk of the range, however, is contained within the borders of Algeria. Many of Algeria's major cities are located within the Tell Atlas Range, including the capital Algiers and the major city Oran. Settlements have occurred in the region throughout history, particularly along the River Chelif. This river is responsible for carrying water into the valleys of the Tell Atlas and transforming them into rich agricultural centers. Panoramic view of a typical Berber village in the High Atlas Mountains of Morocco. The Saharan Atlas runs roughly parallel to the Tell Range in the north, stretching from Algeria in the west to Tunisia in the east. While its average height is no where near the imposing altitude of the High Atlas, it stands in stark contrast to its neighbors, the relatively low lying Tell Range. The highest point in the Saharan Atlas is Mount Chélia (7,638 feet [2,328 m]), which also claims the title of being the highest point in northern Algeria. Agriculturally, the rainfall of the Saharan Range allows for cultivation near wadis, or riverbeds that only run during the wet seasons. When sustained agriculture is possible, the primary occupants of the region are Chaoui Berbers, who utilize the wadis as a profitable alternative to the barren agricultural lands of the northern plateau region. The Aurès Range is the easternmost portion of the Atlas Mountain Range, and is located on the border between Algeria and Tunisia. While distinguished by extremely rough cliffs on the northern side of the range, it is a hospitable place for agricultural development. Like the Saharan Range, when the wadis are available during wet seasons, agriculture takes place in the shelter of the mountains. The primary agricultural wadis of the Aurès Range are Abiod and 'Abdi, both of which face the Sahara. The Aurès Range remains isolated and relatively impassible to this day. The Shawia people who inhabit this difficult terrain have learned to adapt to the physical challenges of living in the Aurès Mountain Range. ↑ Atlas Geoscience Research Group, Potential field modeling of the Atlas lithosphere. Retrieved October 17, 2007. Algeria—The Official Gateway. Algeria Information. Retrieved October 3, 2007. Encyclopedia Britannica Online, Middle-Atlas. Retrieved October 3, 2007. Encyclopedia of the Orient. Atlas Mountains. This page was last modified on 25 April 2016, at 20:06.